Well here I am again with more challenging news about the gardens. Tomato season is almost upon us. Tomatoes are the most popular vegetable grown in our garden and very much anticipated. That’s why it’s disappointing to see some tomato problems starting. Just this week, my tomatoes began to exhibit Tomato Leaf Septoria. This disease is caused by a fungus that thrives in humid, moist conditions. 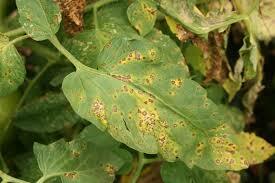 The bottom leaves of the plant develop small black spots , turn yellow, and then brown. 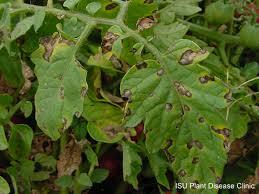 The fungus doesn’t get on the tomatoes themselves but does weaken the plant and shorten it’s production period. Removing the yellow, diseased leaves and branches is the first thing to do. These should not be put into the compost pile but should removed from the garden area. When watering, try to avoid watering the leaves of the plant and focus the water around the base of the tomato plant. The idea is to improve air circulation and discourage the moist conditions that promote the fungus. A copper spray can be used on the healthy foliage to help protect it from the fungus. And, while I was cleaning the diseased leaves from my tomatoes, I was lucky enough to find the first tomato hornworm on my tomato plants . The one I found was still on the small side and I couldn’t find others but I am sure they are there. They are like mice, if you see one, that means you probably have dozens. I will remind gardeners of my quick and easy way to deal with them: a pair of scissors cuts them in half . It’s faster than trying to pull them off since they have strong grasping feet and pulling on them usually means they end up exploding in your hand –not pleasant. However, if you see one carting around a bunch of grains of rice, leave it alone. 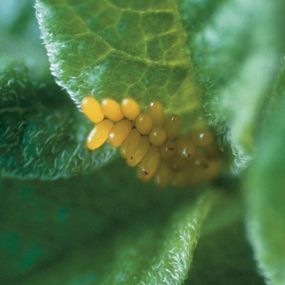 Those are the eggs of a parasitic wasp whose larvae feed on the hornworm and kill it. We want to encourage those wasps. Dear Gardeners, Our gardens are all looking beautiful and are about to burst with fresh food. Just when we are starting to count our squash, tomatoes, beans etc. 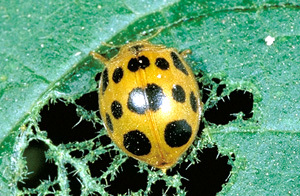 insect pests also arrive to enjoy the bounty. Here are several that I have seen in the garden. 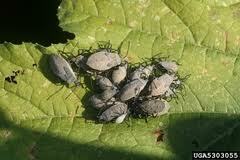 Squash Beetles: There are several varieties of squash beetle. The most common is the gray beetle shown below. 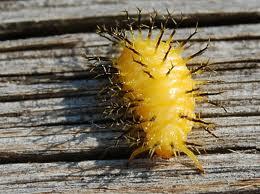 These can easily become swarms that destroy your squash plants if not controlled. 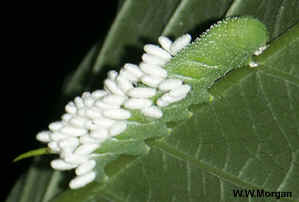 The easiest way to control them is to search your leaves for the eggs. They can appear on the tops or undersides of the leaves You will need to examine each leaf because they can be lurking anywhere. Using duct tape(available in the shed) wrapped around your hand sticky side up, pat the eggs to remove them from the leaves. You will probably need to make several loops of duct tape to remove them all. Dispose of the tape at home and not in the trash cans at Wagon Hill. The gray larvae have wings and can fly everywhere. If you see them. 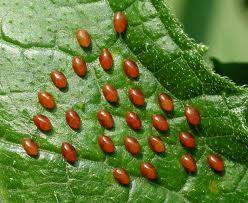 you can try to squish them but a better method would be to get a Safer insecticidal spray to use. Destroying the adults is harder because they do not squish so easily. If you bring a plastic bottle with a narrow opening and a lid you can pick them up and drop them in the bottle. Put the lid on and throw away at home. You will need to check your plants regularly because they keep reappearing all summer long. 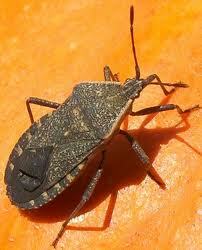 This is another type of squash beetle I have seen. They are not as numerous as the gray ones but just as destructive. Treat them in the same way, destroy any eggs you find on leaves and kill larvae and adults. 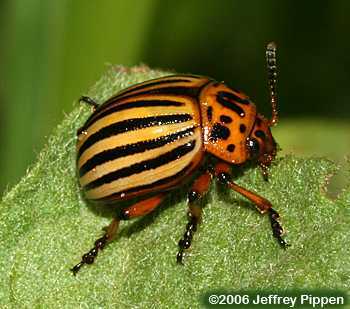 Another insect that we have in abundance, right now is the Colorado Potato Beetle. Again, the best method is to destroy any eggs you see in yellow clusters on the leaves. The larvae are easily squished but I would wear gloves since squishing them bare handed is pretty gross . I have done it in desperation and know from experience. The adults can be picked off and dropped into a bottle. I would encourage all gardeners to “take matters into your own hands” whenever you see any of these creatures on your plants or your neighbors and destroy them. This is something we all can do towards honoring our 4 hour work commitment. Keeping these guys in check is of great benefit to everyone. 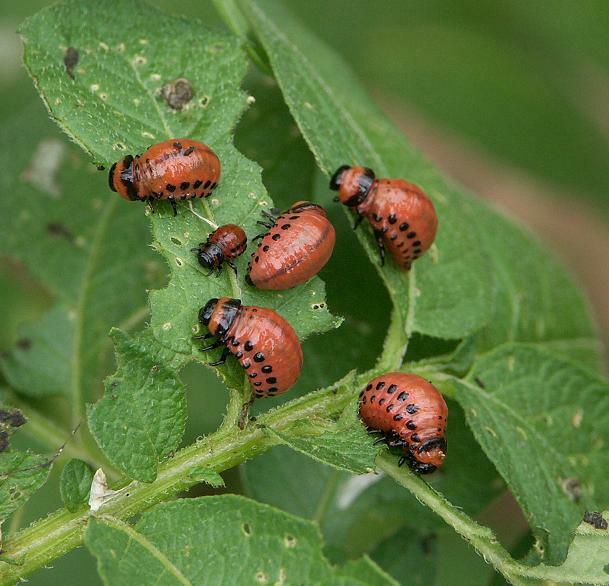 Finally, a reminder to check your garden at least once a week for pests and, more importantly, for food that is ready to harvest. With the rain and sun we have been getting, things are growing fast and you may be surprised to find your plants producing very quickly now. You want to be sure to reap the benefit of your labors and harvest your food at it’s peak. Baseball bat zucchini is not very tasty. This is a list of disease resistant vegetable varieties that I thought would be very helpful to our gardeners planning for next season given the issues we’ve had. I will continue to research this and provide other links on our Resources page of the website. I have heard some gardeners say they are discouraged so maybe this information will give them some hope. 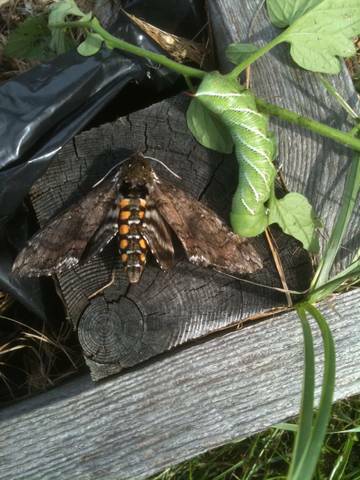 Both of these specimens (tomato hornworm and the moth it becomes) were collected from the tomatoes on my straw bale garden. Notice how the hornworm is happily chomping on the tomato leaves? These creatures are making their presence known in the garden now. You will know you have them on your tomatoes if you see denuded stems and lots of droppings that look like peppercorns. These guys can be three inches long and they have gripping “feet” that cling when you try to pull them off. I have found it easier to take a pair of scissors and cut them in half. Gory but effective and fast. The hornworm can destroy your tomato plants and will eat the tomatoes as well.